Medical tapes and bandages are being used on to maintain moisture at the site of dressing, speed up the process of wound healing and offer bacterial protection to the wound. Increasing awareness about wound care, the rise in a number of surgical procedures being done and growth in the aging population are some of the factors leading to the increased application of medical tapes and bandages. Manufacturers are offering medical tapes and bandages that are waterproof, micropore, and pressure-sensitive. Various types of materials are also being used to produce medical adhesive tapes such as cloth, paper, silk, etc. The use of zinc oxide tape and trans-pore polyethylene medical tape is also increasing. Manufacturers are also focusing on producing medical tapes that are gentle to the skin and paper tape consisting of a latex-free acrylate adhesive. The report offers an in-depth insight into the critical factors of global medical tapes and bandages market and further offers information on the growth factors, competitive analysis, segment-wise analysis and factors resulting in the market growth. The report is based on the systematic research approach which has been used to arrive at the relevant numbers of the global medical tapes and bandages market. The secondary research has also been conducted to determine at the key industry players, applications, products, industry connotations, overall market size, and distributors and others. The questionnaire was also been prepared to conduct expert industry interviews. The report also provides the list of industry players (manufacturers), distributors, and retailers. The global medical tapes and bandages market is evaluated on the basis of regional penetration, along with the explanation on how the market performed in each region. Various analytical tools including market attractiveness analysis, investment return analysis, and investment feasibility analysis are used to study the global medical tapes and bandages market. Meanwhile, SWOT analysis and Porter’s five forces analysis were used to provide in-depth analysis of the market and market dynamics such as trends, drivers, opportunities, and factors responsible for hampering the growth of the market. The global medical tapes and bandages market is segmented on the basis of product type, end user, application, and region. On the basis of product type, the market is segmented into medical bandages and medical tapes. On the basis of the end user, the market is segmented into clinics, hospitals, ambulatory surgery centers and home care settings. By application, the market is segmented into surgical wound treatment, traumatic wound treatment, ulcer treatment, sports injury treatment, burn injury treatment, and other applications. On the basis of region, the global medical tapes and bandages market is segmented into North America, Asia Pacific Excluding Japan (APEJ), Europe, Japan, Latin America, and the Middle East and Africa (MEA). The market size and forecast for each region, and segments including product, end user and application has been provided in the report. CAGR in form of percentage has also been provided in the report for region and each segment. Competitive dashboard including analyses of leading market players. Historical data, current market analysis and a forecast of the market for the period from 2017 to 2022. Market analysis, with study of key regions. Unbiased outlook towards the global market and data estimation. Key players are intent on offering new wound protection products, for example, wound healing or dressing products that are sensitive to skin, encourage natural healing, as well as provides room for the wound to heal. Meanwhile, increasing number of Healthcare Acquired Infections (HAIs) is driving manufacturers and hospitals to seek newer methods for reducing infection. Hence, the use of medical tapes is rising that can help reduce the incidence of infections. Key players in the market are focusing on strengthening their medical bandages and medical tapes product portfolio. Hence, companies are launching new products with unique features for specific purposes. Growing concern about patient safety is also resulting in the use of better products enhancing the wound healing process. 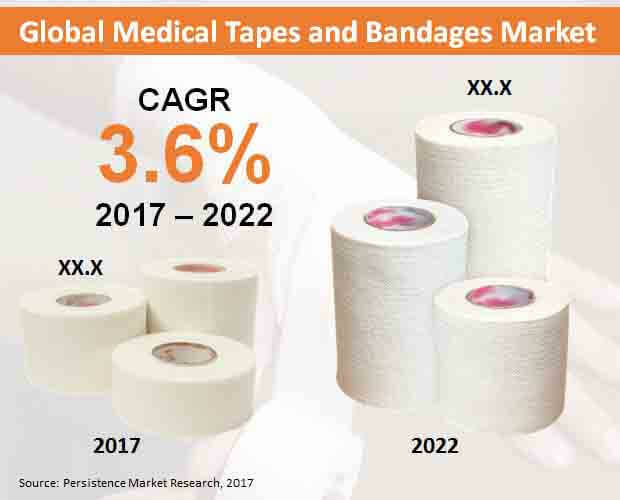 Also, increasing prevalence of chronic diseases directly related to the chronic wounds such as cardiovascular disease and diabetes mellitus are likely to boost the growth of the global medical tapes and bandages market. The demand for multi-layer adhesive tapes is also gaining traction in the neonatal units. However, lack of proper guidelines on using medical tapes and bandages is restricting the market growth. Medical Bandages are likely to emerge as one of the top-selling products in the global market for medical tapes and bandages. Medical bandages are projected to surpass US$ 5,800 million revenue by 2022 end. Meanwhile, medical tapes are also likely to witness growth during 2017-2022. Compared to the various end users, hospitals are likely to gain nearly three-fourth of the revenue share by 2017 end. Hospitals are also estimated to bring in nearly US$ 4,100 million revenue towards 2022 end. Increasing number of treatments and surgeries being conducted in hospitals is one of the factors leading to the rise in the use of bandages and medical tapes. Medical bandages and tapes are likely to find the largest application in surgical wound treatment during 2017-2022. Surgical wound treatment is projected to create an incremental opportunity of more than US$ 500 million during 2017-2022. Meanwhile, bandages and medical tapes are also likely to be used for traumatic wound treatment. North America is likely to be the largest market in the global market for medical tapes and bandages. By 2022 end, North America is projected surpass US$ 2,200 million revenue. Increasing number of orthopedic procedures being carried on in the U.S. is driving the demand for bandages and medical tapes. There has also been a shift from traditional wound dressing process to the advanced dressing process using new types of bandages and tapes, resulting in quick healing. Presence of key players launching innovative products is also one of the factors fueling growth in the region. The government in the U.S. and Canada have also introduced various regulations and initiatives in healthcare sector helping in the establishment of new healthcare practices, development of advanced technology and better healthcare infrastructure. Some of the key market players in the global market for medical tapes and bandages are Medtronic plc, 3M Company, B. Braun Melsungen AG, Johnson & Johnson, Smith & Nephew Plc, Nitto Denko Corporation, Cardinal Health, Inc., Beiersdorf Aktiengesellschaft, Lohmann & Rauscher International GmbH & Co. KG, Paul Hartmann AG, and Medline Industries Inc.